4.4 out of 5 based on 641 bloggers and 150 commenters. 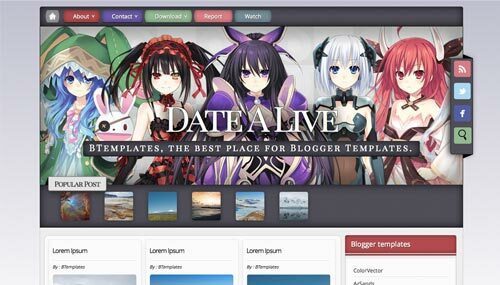 Date A Live is a free premium blogger template with 2 columns, right sidebar, gallery-styled, web 2.0 design, fresh look, rounded corners, an exclusive design for Blogger, footer columns, social bookmarking icons, posts thumbnails, drop down menu, breadcrumbs, a background pattern, related posts support, well designed threaded comments, girly looking and vectorial elements. Excellent template for blogs about anime, fantasy, games, kids or photography. Xavy, necesitas ponerle la misma etiqueta a los post. Al parecer se arruinó el script que hacía desplegar el título de los post relacionados. Fíjate que a todos los que tienen esta plantilla les sucede lo mismo. Creo que sólo queda esperar que lo arreglen o poner otro script. Yo quisiera saber porque cuando quiero compratir algo en facebook no aparece imagen sino solo el titulo de la entrada. I created a post, but it’s not opening when I click on it. How can I fix it, and how to make it appear in the popular posts? Me hice un blog con esta plantilla, pero hay algunos aspectos que me gustaria solucionar, uno de esos inconvenientes es que no me muestra las imagenes de post populares y cuando poso el cursor por esa zona me muestra tan solo el titulo, otro aspecto es que en los post relacionados me muestra la misma imagen para todos los recuadros (una imagen de Miku). At the home page, as I click on the post thumbnail it shows the number of comments, which is OK, but the date appears as undefined. My blog is working pretty good. Can i make changes in this template? Once cool, I’ll take it to my blog template…. thanks boss… good template.. i like this..
How to change Blog Title background? how to replace the front cover? Good template. I want to know, how can i change the size of the shown entries. I mean, two entries in a arrow and so on. Hey.. this template is very beutiful..
the maximal content for popular post is 9 posts, but when it reach 10 there’s 10 popular posts. the 10th popular post come down the first post. so it looks bad. and there’s is no older post button after my post over the limit of the post shown. Mr TikTok, I almost lost my mind searching this damn max posts in the code. then, easily I found it in the LAYOUT section, under POPJO>popular posts widget. There you can change it from 10 to 9. If I can help you more, leave a message here with your email. Olá, lindo template. Queria saber como faço para mudar a imagem que tem logo no começo, eu gostaria de por outra imagem, é possível? Obrigado. Alex, necesitas cambiar el formato de fecha. Arriba hay un enlace sobre como cambiarlo.